If Zhuge Liang has no armor equipped, he has the protection of the eight trigrams. Zhuge Liang can use any of his red hand cards as a blaze. Zhuge Liang can use any of his black hand cards as a negate. Zhuge Liang is considered to have the Eight Trigrams equipped when he has no other armor. As such, he cannot flip a judgement card for an Escape if he is attacked with the Black Pommel. Zhuge Liang is an incredibly useful support character. He is great in many team situations because his "See Through" can provide negates for his team very easily. "Eight Arrays" is a great deterrent for Attacks, as enemies will be less likely to try to Attack you if there is only a 50% chance that it will get through your first defense. Because of this, it is less necessary to keep Escapes in your hand outside of your turn. "Fire Strategy" allows Zhuge Liang to target any character, regardless of their distance from you. 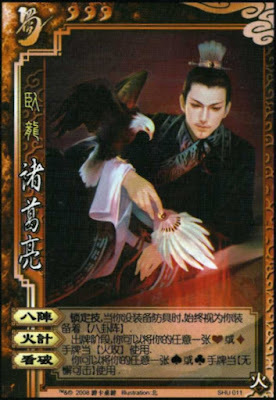 "See Through" requires Zhuge Liang to keep black cards in his had at the end of his turn. As such, he will need to restrain himself during his turn to enjoy the advantage that this power gives him. "Fire Strategy" is very expensive. This is not good for Zhuge Liang, as he has to be sure to keep plenty of black cards at the end of his turn, as explained in the previous bullet. Becuase Zhuge Liang only has three units of health and can only hold three cards, he has to use "See Through" sparingly. If he uses all of his black cards in his hand too quickly, it will become apparent to his enemies when he has run out of Negates. Zhuge Liang is often perceived as a very powerful character. This high-profile status may make him a target for enemies if they have the right cards to hurt him. Zhang Liao/Gan Ning/Zhang He - These characters specialize in card destruction, which is very effective in stopping "See Through" when they target Zhuge Liang with their abilities. Zhang Jiao/Sima Yi - These characters are judgement tinkers. They can cripple his "Eight Arrays" defense. Also, it is difficult for Zhuge Liang to fight Sima Yi. If Zhuge Liang damages Sima Yi, Sima can take one of his hand cards and dampen the advantage that he has from his "See Through" ability. Huang Zhong/Ma Chao - These characters have abilities that prevent their enemies from Escaping their Attacks, mitigating the advantage of "Eight Arrays." Diao Chan/Xun Yu/Dian Wei - These characters can deal damage directly to Zhuge Liang and bypass "Eight Arrays." Liu Bei/Guo Jia - These characters can help Zhuge Liang a lot by giving him black cards for his "See Through." King Zhuge Liang is not a good king pick, despite his very defensive nature. When he is the center of attention, he runs out of black cards quickly. Without Negates, it is easier for rebels to find ways to bypass "Eight Arrays." Zhuge Liang is a good loyalist. "See Through" is very useful in protecting the king against nasty tool cards like Capture, Starvation, Steal, etc. Rebel Zhuge Liang is a great team player, so he can perform well as a rebel. Again, "See Through" will go a long way in protecting his team against time-delay tool cards. Also, "Fire Strategy" can target the king no matter how far away they are from Zhuge Liang. Spy Zhuge Liang is actually a good spy pick. He can easily control the flow of the game by using "See Through" to benefit whichever team is currently at a disadvantage. Because he is such a defensive character and there is no reward for killing him, he should not be that much of a priority for other characters to kill. This will help him last longer. To a beginner, Younger Zhuge Liang seems like he is very overpowered. However, this is not the case. As stated earlier, he has to restrain himself to store black cards and provide the maximum benefit to his team outside of his turn. "Fire Strategy" is very expensive because he has to spend two cards to deal one unit of fire damage. As such, it should not be used too frequently. It is better to mainly use this power on enemies who are wearing the Wooden Armor or those who have few units of health remaining.